Although it's not an app that I reach for constantly, it's a useful app to download. It's an alternative editing software app, but the main reason that I've included it on this list is because it's great for if you want (or need) to add a watermark to your photographs. 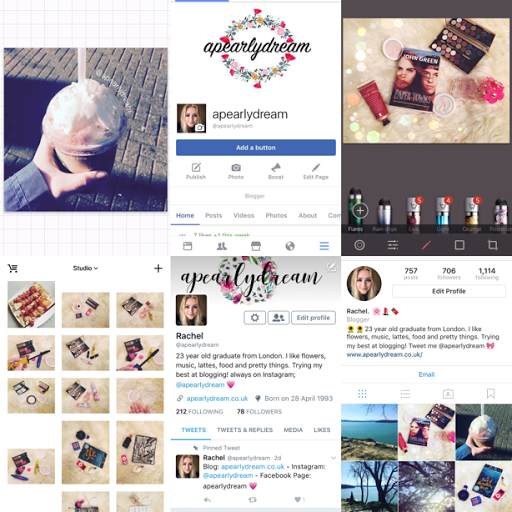 As you'll see in the screenshots above, I've added an @apearlydream in white to show you how it can be used. From a text-based perspective, this app is fantastic as not only is it free, but it allows you to choose the colour of your and font of your text, but the size, shape, angle... It's great if you want to make a watermark work for any photo and I suspect many of the millions who watermark on instagram will use this app as it's so easy to use and very customisable. This app is not a must unless you want to make use of your page within the app. I, myself have only recently got back into making an effort on my Facebook blogger page. I admit I don't love it as much as I've started to love Twitter, or my beloved instagram but it is a great way of updating your social media. Bloggers can advertise for free on Facebook and other social media so I feel like any form of advertising that's free should be something utilised fairly frequently. One downside to having a Facebook page is that it's harder to reach out to new followers unlike on instagram or twitter, but it's another great way of registering a business, brand or website. Personally I think this is a really useful app, it's definitely an essential for me. When I'm taking photographs for my blog I always edit them afterward and this app is great for adding little girly touches to photography. It's free to download but some of its features are only useable via a purchase. I've never purchased anything as I like the free 'flares' that you can draw freehand onto images for a nice effect. If you look at the screenshot above, you'll see that there is a lot of the photographic bokeh technique across the blog photograph; the reason why I love this app so much is that it adds a special something to photographs without having the need to be a fantastic photographer or use fancy equipment. It's so easy to use, you literally select flares and then pull you finger across the image. I feel like it makes my blog photography a little more interesting. I never used to see the point of VSCO as I felt that whatever it could do, could be done via instagram as it's ultimately a filter app. However, now I don't think I'd be able to create nice blogger photographs without it; I love how it converts bland colours into bright, vibrant textured photographs with simply the choice of a filter. I like the studio aspect of the photographs too as this means I can plan how to edit my photographs so that they have a similar layout and colour scheme; I'm not massively keen on themes but I do like to have some consistency. The filter F2 is my favourite, although I love how easy to use VSCO is. With the touch of a finger on a screen, it's simple to change the brightness, contrast, crop, saturate, temper and grain an image. It's a basic version of photoshop that even allows you to choose the size and quality of your edited image. Since I've rediscovered this app, my blogging photography has improved so much without the need to buy expensive equipment. I've only recently joined the twitter hype, several years too late... I've learnt in the past few months how much utilising various forms of social media can really help with exposing your blog to more traffic; since becoming more active on twitter, not only have I found many more interesting bloggers within the community to follow and blogs to enjoy, but also a way of engaging with others easily. It's also free promotion for your posts and a great way to gain inspiration through following those such as @Bloggeration @FemaleBloggerRT @TheGirlGangHQ or @BBlogRT to name a few accounts that promote your blogs to their followers, basically free advertising from within the blogging community. I deliberately made my twitter handle the same as my blog and other social media so that all of my accounts are easy to find and there's a consistency in all areas. This app is definitely an absolute must for any blogger; there are so many bloggers, new and old, of all kinds of genres from fashion and beauty to lifestyle and fitness all over this app. It's such a fantastic way to put yourself and your photography, your blog, likes and opinions out through using a mostly visual layout. As blogging is such a visual way of expressing yourself, it works really well alongside instagram as a way of promoting your work for free. It allows you to build up a network and focus on your branding; I'm not a huge fan of instagram themes, but I do like to have some consistency in my feed which will ensure that the search option will suggest profiles and feeds that match with mine, that will interest and inspire me. Likewise with my other social media, it made sense to match my profile name to my blogging name as it does make it clear where to find me across all areas of the internet.